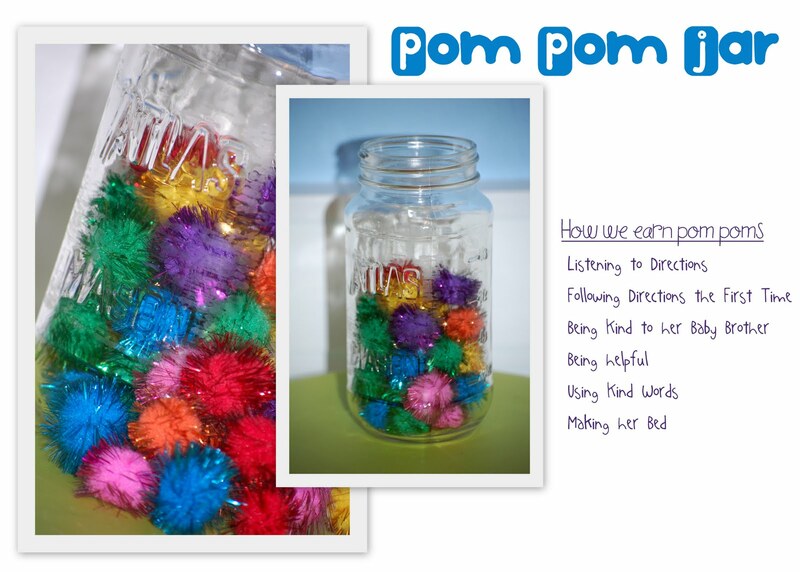 Our Pom Pom Jar....What behavior reward systems work at your house? As school is starting on Monday, and the kids are getting back into their school year routines it is often hard to come up with the patience to deal with poor behavior. Here's a quick tip for how we keep the peace while raising a sassy little 3 year old and a giggly little 5 month old. We have a Pom Pom Jar that sits on the kitchen counter (a fancy name for a plain old spaghetti sauce jar) Kaitlyn earns pom poms for doing various things, whether its good behavior or a reward for finishing her chores. She also can have them taken away for unfavorable behavior or not completing her chores. Each line on the spaghetti jar is a reward that she can earn. Last month we went to Orlando and Kaitlyn wanted some figurines from the movie Tangled. It came with 8 different figurines. So they sat on the top of the refrigerator and each time she reached one of the lines on the jar she earned one of the figurines. The jar is not only for earning tangible items, some times she earns priviledges as well. Once we fill up the jar Kaitlyn decides what she wants to earn next, this month she is working toward a date night with mommy and daddy to go see a movie. We have found that this is a rewarding system for her and it helps her to be responsible for her own actions around the house. With kids it's important to show tangible consequences when an undesirable behavior is displayed, having her take the pom pom out of the jar is reinforcing which behaviors are acceptable and earn her pom poms and which are not. This has been a great system that we use in our home, What do you find works in your household for your little ones? Great idea! I like this better than ours. We were doing it where if they earned enough stars by the end of the week we'd do something special but they rarely got all 5 stars in a row so we'd never end up doing the planned event. I'm going to try this for sure! And I like that "they" choose what to work toward! The next 364 Days..What will you do?